Preschoolers love craft time. When it comes to doing kids crafts, we especially like ones that use recycled cardboard tubes. The rainy days of spring are perfect for crafting. 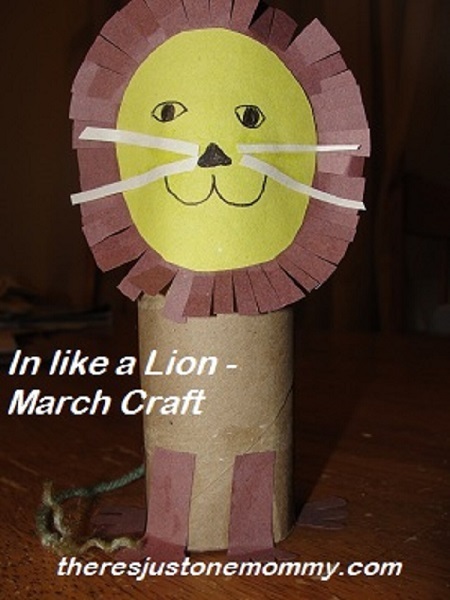 The old saying, “In like a lion, out like a lamb,” makes this cardboard tube lion craft perfect for the start of March! Glue the yellow circle to the middle of your larger brown circle. Use scissors to snip fringe around the edges of the brown circle to create your lion’s mane. Draw a face for your lion. If desired you could use wiggly eyes. To put your lion together, glue the head to the top of the tube, overhanging the top a bit. The front and back legs get glued to the bottom of the tube with the “feet” overhanging so you can bend them to rest on the table surface. For the lion’s tail use the point of a pen to poke a small hole at the back of the tube. Tie a knot into one end of the yarn and then pushed the yarn through the hole. To keep the tail from falling out, tie another knot at the other end of the yarn. 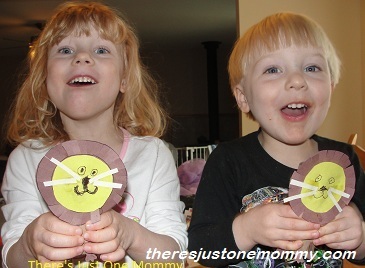 This simple lion craft for kids is the “purrfect” March craft for preschoolers. Oh, I am soooo ready for that one as well! Thanks for linking up to Fine Finds Friday! I’m glad you found me- and I’m glad to now have found you! I look forward to following your cute ideas! Thank you so much for hosting! Looking forward to coming back next week! Thank you! Sometimes they are so cute it’s hard to throw them away. I should link our lamb craft up to this one! 🙂 I remember doing lion and lamb crafts at school, too!